As per the Income-tax Act provisions applicable till 30th Septmber 2013, a person making any payment to a non-resident is required to obtain a Chartered Accountant’s (CA) certificate in Form 15CB or a certificate from the tax officer before making the payment. 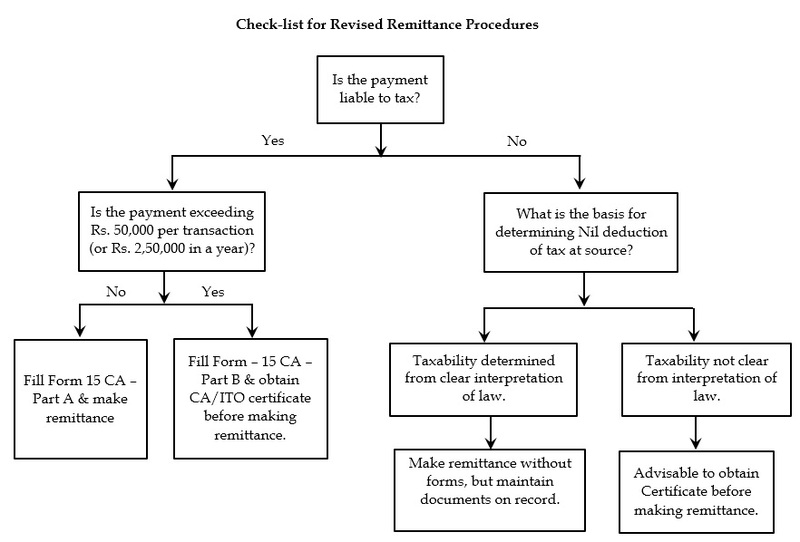 Further, the remitter is also required to submit additional information as per Form 15CA. These procedures were required for each remittance, whether the amount was taxable or not in the hands of the recipient. In practice, for some payments like imports, some banks were not insisting on these forms and certificates. 1.1 The amended provisions no longer require submission of any Forms as long as the payments are not chargeable to tax in India. Therefore, payments towards a large number of transactions which have no tax implications can now be remitted without submission of any forms. For example, remittance for import of goods; investment in shares; gifts to relatives; or towards expenses like travel; etc., can now be made without submission of any forms to the bank. However, documentary support for each transaction should be maintained to provide them to the tax officer, if required at a later date. For example, for travel expenses, tickets can be maintained. 1.2 Further, the rules also include a Specified List of transactions for which it has been clarified that forms and certificates do not have to be provided. This list includes transactions in the nature of overseas investments or loans; remittances towards business & personal travel, transfer of savings by non-residents; personal gifts & donations; freight insurance; payment of taxes; and payments towards international bidding. 1.3 Please note that while the new rules provide a significant relaxation, the tax officer can dispute the claim of the payment not being taxable in India at a later date. Hence, this relaxation should be used only for those payments where there is no scope of taxation at source. Therefore, even where the transaction is included in the specified list mentioned above, it must be ensured that there is no tax liability. For example, while remittance of savings from an Indian bank account to a non-resident’s own overseas account does not have any tax outgo, it must be made certain that the remittance is from incomes on which taxes have already been paid in India. There can be a possibility that the payer while making the payment has not deducted tax at source. This would not entitle the non-resident to remit his savings without deduction of tax at source. Similarly, for gifts made by a resident to an unrelated non-resident, there can be tax deductible at source. If there is any doubt regarding the taxability, the procedures should be complied with and appropriate certificate should be obtained before making the remittance. 1.4 Further, wherever the income is not chargeable to tax due to a controversial interpretation of law, it would be better to apply for a certificate from the CA or the income-tax officer, and fill in the necessary forms before making the remittance. For example, where taxability on certain type of income is a matter of frequent litigation, it would be advisable to take a certificate from a CA or income-tax officer for correct deduction of tax at source. 1.5 Banks may have their own requirements to allow remittances without submission of any forms. They may require submission of appropriate documents or undertaking. Please check with your bank and confirm these changed requirements beforehand. Rs. 50,000 but the aggregate of such payments crosses Rs. 2,50,000 at a later date. In such circumstances, Forms may be required to be filled in for past transactions too. If it is clear as per the contract or agreement that the payments will cross Rs. 2,50,000 in a financial year, it would be advisable to comply with the procedures from the first payment onwards. Transactions above the threshold limits of Rs. 50,000 each or of Rs. 2,50,000 in aggregate would require providing information as per Part B of Form 15CA along with a certificate from the CA in Form 15CB or a certificate from the tax officer. Part B of Form 15CA requires detailed information regarding the remitter, remittee, the certificate obtained, and the basis for deduction of tax at source. Further, an undertaking is also required to be provided. The revised Forms 15CA and 15CB are enclosed with this note. The revised Form 15CA is now available online at the income-tax e-filing portal – www.incometaxindiaefiling.gov.in . The payer needs to login to the portal, and sign with his digital signature for accessing the Form 15CA. In our knowledge, some banks are asking for issuance of Forms 15CA and 15CB in all transactions which are not covered within the Specified List. In our view, payment for any transaction which is not taxable in India can be remitted without submission of any forms. The tax department has done away with needless filing of forms for transactions where there was in any case no tax to be deducted at source. However, wherever there is any doubt regarding the taxability of remittances, it would be better to obtain a certificate before making the remittance. We have prepared a check-list that can be adopted for each payment to be made. The same is annexed with this note. 1. Notification for Revised Forms 15CA and 15CB.